The Entertainer (TheToyShop.com) is the UK’s largest chain of independent toy stores. It has 127 UK stores and 6 across the rest of the World. Find your nearest store here. True experts in toys, stocking popular ranges from VTech, Peppa Pig, Lego and Furby, The Enterainer’s stores are great fun, often with live toy demonstrations taking place throughout the day and always with cheerful staff and famously great service. The Entertainer care about their staff as much as their customers – unusually none of their stores open on a Sunday. The Entertainer believe in good, wholesome fun. You won’t find overtly violent toys here. Their website at TheToyShop.com has won them Online Retailer of the Year several times, and offers free delivery over £40 and the option to collect free from any store just 30 minutes after buying online! Where can I check the balance of The Entertainer gift cards? You can check your The Entertainer giftcard balance instantly online by clicking here. You can take the card into any UK store to check the balance. Click here to find your nearest store. Where can I buy a gift card for The Entertainer? You can buy a giftcard direct from The Entertainer’s website by clicking here. Both postal and e-gift options are available. Delivery costs £3.99 but is free over £40. Giftcards by post are also available from Voucher Express with a delivery charge from £1.75. 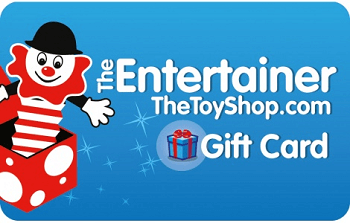 Is there anything else I should know about The Entertainer/TheToyShop.com gift cards? The Entertainer gift cards will expire after 24 months of inactivity, so make sure you use your card before it expires to avoid losing the balance on it. If you aren’t ready to spend your card but are worried that it might expire, it is worth knowing that you can top it up in any The Entertainer store. If you register your card with TheToyShop.com online, you can protect the card further – if you have registered your gift card and it is subsequently lost or stolen, you can return to the site to request a replacement, an excellent feature for piece of mind. Cards can also be ‘topped up’ online, which is very handy if you want to use it for pocket money. The Entertainer gift cards can carry a maximum of £250.